Buck's Movers is a family-owned and operated, full service, licensed and insured moving company based in Santa Barbara & Ventura County, offering residential and commercial, local as well as long distant, moving services. Buck's Movers also provides both short/long-term and indoor/outdoor storage. Call today to schedule your free on-site estimate. Buck's Movers provides professional residential moving at affordable rates whether your moving local or long distance. The movers at Buck's are highly experienced in relocating offices, industrial spaces, moving lab and restaurant equipment, machinery and more. With a wide variety of equipment including cranes, forklifts, and stair-climbing hand trucks, Buck's can handle almost any type of move. 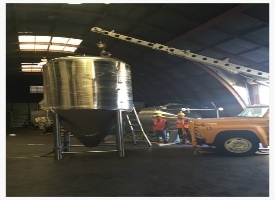 Bucks movers has been successfully providing innovative solutions to meet the challenges of complex lifting, strategic rigging and transportation for both small and large projects. 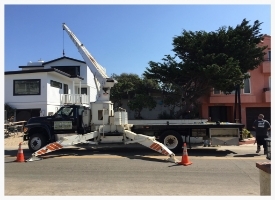 With our vast list of equipment such as hydraulic cranes, forklifts , genie lifts, motorized stair-climbing dollies , roll-back flatbeds and more, we have the capability to provide services a notch above your average moving company. Buck's Movers is a family owned and operated moving company established in 1995. We are also your local 48 State Freight agent finding you the best rates on any of your shipping / transporting needs. We are fully licensed, bonded and insured. Precision, reliability, accountability. These are the characteristics that companies should seek out when looking for a commercial mover to relocate their business. At Buck's Movers & Storage we have a long standing tradition of providing customize commercial moving and storage solutions to businesses since 1995. One of the most significant cost associated with moving a business is the loss in productivity of staff members, whether moving a small business across the street or moving an entire facility across the state, Buck's Movers & Storage is committed to preserving the productivity of our customers businesses' during the relocating process. We pride ourselves on being the only commercial moving company in Santa Barbara that offers customized services beyond the typical move. Buck's full service specialty movers and rigging specialist have vast knowledge and experience in moving all types and sizes of machinery, and other heavy hard to handle items such as appliances, medical equipment, building materials, etc.